Since selling my beloved Nissan Xterra, back in October of 2016, I've been driving Nadia's 2011 Nissan Versa sedan. While the Versa is a great economical car, with lots of room, it's a base model and really doesn't have much in the way of creature comforts. This statement couldn't be more true, when searching for the non existent trunk light. Yes, that's right, this vehicle does not come factory equipped with a trunk light! So I ask, what's the point of having such a large trunk, if you just can't find anything in it? As you all know this just isn't acceptable, so my first Versa related project would be to add a trunk light. While I had every intent on making this the first project, I quickly discovered that not only was there no trunk light, there didn't seem to be any usable sources of power in the trunk. I figured I would probably be upgrading the stereo, and adding an amplifier in the future, so I might as well run power from the battery to the trunk, hopefully killing two birds with one stone. 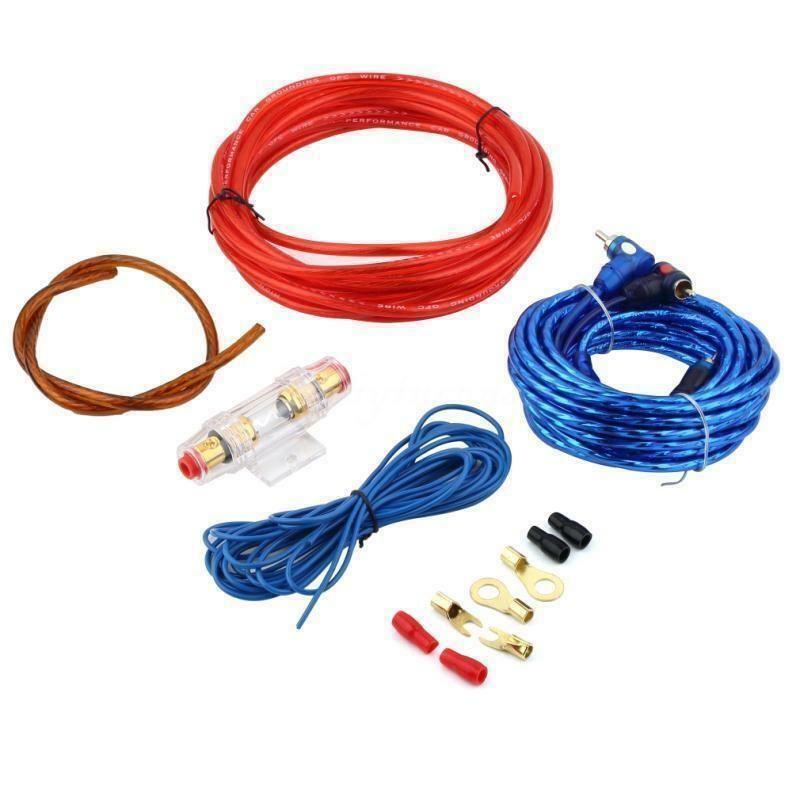 Since the Versa would never be getting a high end stereo system, and all we needed was power, I opted to buy an amplifier wiring kit from EBay. The kit cost me about $11 (CAD) which is about 1/3 the cost of similar kits sourced locally. Even though the amplifier kit came with a inline fuse, I opted to buy a 20 amp inline circuit breaker, also from EBay for about $9 (CAD). If there is ever any trunk related power issues, this $9 investment would pay off, as you never need to search for costly replacement fuses. Also by pressing a button you could disable all power to the trunk, a great safety feature in my eyes. Since I was shopping on EBay, I also purchased some 8 gauge firewall grommets for about $8 (CAD). While I'm glad I purchased the grommets, I didn't end up using them because there was already a factory hole and grommet in the Versa's firewall, which I ended up using. I've really become infuriated with how long it takes to get parts from EBay lately, and the fact that most parts don't even show up anymore is ridiculous. With this Versa project however it didn't have that much of an impact, due to all the rain we've been getting I couldn't do anything anyway. Searching the www revealed that behind the drivers side kick panel, located under the dashboard, was an existing hole in the firewall with a grommet. With this knowledge the rest of the project was pretty smooth sailing. I would be running the power wire through the hole found directly behind the wires shown in the photo above. Cutting a small hole in the grommet allowed me to easily push the power wire through both the grommet and the hole. 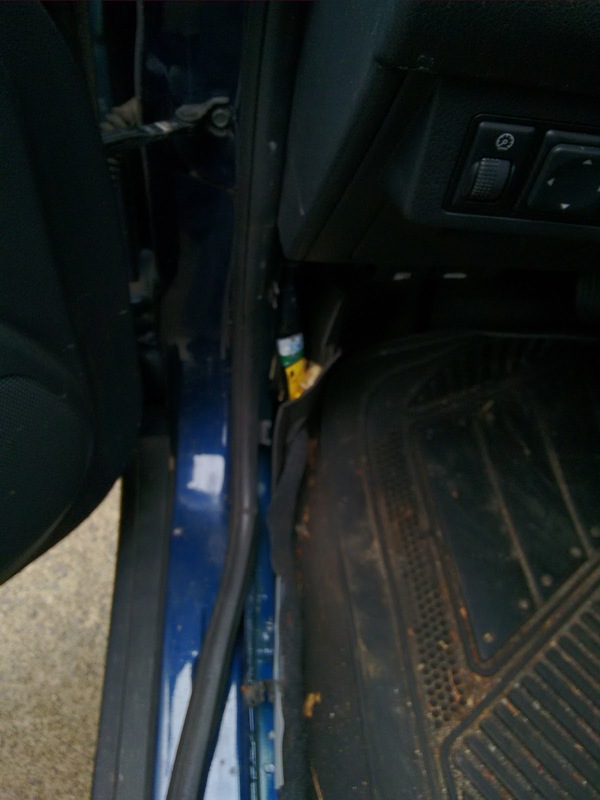 This resulted in a tight seal, so as to not to have any problems with water entering the car in the future. In order to feed the wire from the grommet to the battery, i needed to remove the drivers side front wheel, and fender liner. This was a bit time consuming, and a little confusing as I couldn't see all the retaining clips initially. I believe industry standards for car audio require any power wires leading off the battery to have a fuse mounted within 1 foot of the battery. With this in mind I found what I believe to be a suitable location to mount the inline circuit breaker. 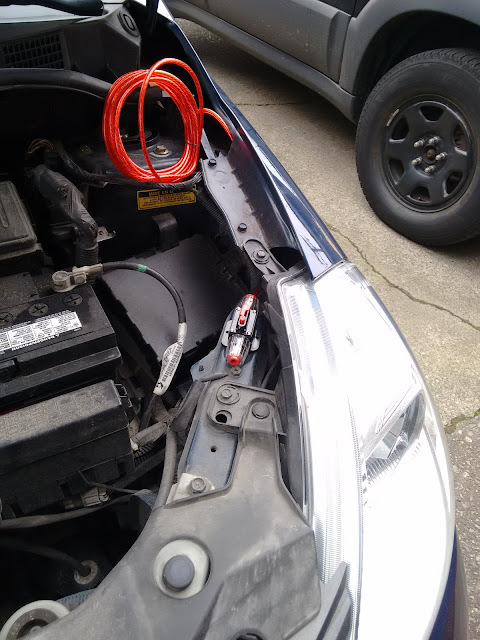 I connected the power wire to the battery terminal (I soldered the included ring terminals to the power wire, and protected it using the provided heat shrink tubing), and then secured it to the circuit breaker before pulling the slack back out the drivers side kick panel (the circuit breaker was off). I ran the power wire along the side of the car, under the carpets along with all the factory wiring. I put everything back together, and finished with the first part of this project. I will have more picture in the follow up post.